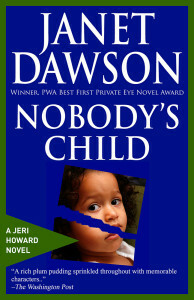 In Nobody’s Child, a young runaway is dead, her body dumped at a construction site. And her two-year-old daughter is missing, last seen on the mean streets of Berkeley among the homeless. It’s a cold rainy winter and time is running out for the little lost toddler. 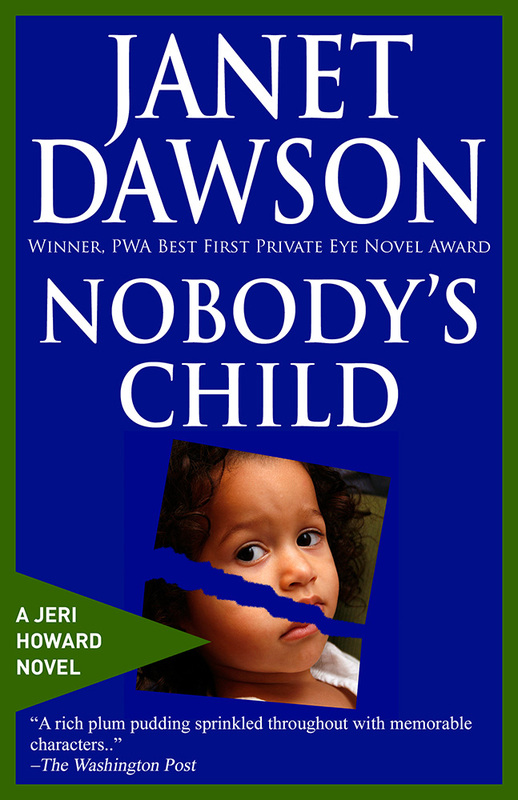 Can Jeri find the child before it’s too late? “Mind if I smoke?” Mrs. Smith asked. I did mind, but the woman who sat across from me appeared to be in desperate need of a cigarette. Without saying anything, I pulled open a desk drawer and took out a glass ashtray, setting it on the desk surface between us. She immediately went into that preparatory routine a lot of smokers have, only she wasn’t carrying a cellophane-wrapped pack of butts and a book of matches from some bar. She reached into her black leather clutch purse and pulled out a brushed gold cigarette case with a matching lighter, both engraved with a pair of initials I couldn’t quite make out. She flipped open the case, shook out a thin black cigarette, shut the case and whacked the end of the cigarette against it before flicking open the lighter. She fired up the cigarette and sucked in smoke as though her carmine lips were clamped around the mouthpiece of an oxygen tank. All of this took a few minutes but it gave me the opportunity to examine her. Mrs. Smith—or so she called herself—looked as though she’d drawn the age line somewhere around fifty. She was skinny to the point of emaciation, her bony frame draped in a scarlet designer suit trimmed with black at the collar and cuffs, and fastened with a row of shiny jet buttons. It probably cost her the equivalent of a month’s rent, if not more, on my humble office here in downtown Oakland. Her skeletal fingers were weighted with jewelry, all of it gold with big chunky stones, one of them a blood-red ruby the size of my thumbnail. I couldn’t tell what color her hair was. It was concealed by a black turban decorated by a wicked-looking hatpin topped by a another ruby. Under the expertly applied layer of expensive makeup, her narrow sharp-featured face was sallow and yielded no secrets. The eyes beneath the plucked brows were brown. Not warm brown, mind you, but a dark hard surface, like highly polished rock. The only passion I’d seen in those eyes had been quenched when she obtained her nicotine fix. I straightened in my chair. Behind me, rain rattled against the window pane that provided the only source of natural light in my long narrow office. I sifted through my brain’s memory banks until something clicked into place. The local media hadn’t given it much play, but I recalled some details. The decomposing corpse of a young woman had been found several weeks ago, buried in the rain-softened soil next to the denuded concrete foundation of what had once been a house on Buena Vista Avenue, in that part of Oakland where the East Bay fire a few years back had consumed people and animals as well as houses and vegetation. A construction crew doing some work on the lot had found the body which, as far as I knew, had not been identified. “I don’t know anything about it.” Her voice was as cold as her eyes. The turbaned head tilted slightly to one side. She sucked on her cigarette and recrossed her legs. “Want to see my driver’s license?” she snapped, her tone matched by the poisonous twist of her lips. She reached into her clutch bag, then tossed a brown eelskin wallet at my face. I caught the missile in midair and opened it, scanning the credit cards and the California driver’s license with the usual unflattering photo. Her name was Smith, all right, Mrs. Naomi C. Smith. She lived at an address in Piedmont, an upper-middle-class enclave completely surrounded by Oakland, where expensive houses sat on winding hilly streets shaded by trees. I sighed. Despite my antipathy toward this woman, she had roused my curiosity. She took her time answering. When she spoke, her thin lips curved, more like a grimace than a smile. I sat back and stared at her. “Why are you here? You should be talking to the police. I can give you the names of the detectives handling the case.” As I knew from the account in theOakland Tribune, they were my ex-husband, Sid Vernon, and his partner, Wayne Hobart. She looked as horrified as if I’d suggested she peddle crack in the Grand Lobby of the Paramount Theatre. The rain spattering against the window behind me increased in intensity as I looked across my desk, trying to read the woman’s face. What she wasn’t telling me spoke a lot louder than anything she’d said so far. Why didn’t I just send her out the door? She grated on me like fingernails screeching down a blackboard. Maybe it was the whole mother-and-daughter thing. I’m a veteran of that particular war myself. Maybe it was the thought of that unclaimed, unidentified, unmourned body lying in a refrigerated drawer over at the coroner’s office, with no one offering to bury it again, this time in a coffin, with some flowers and a few words said over it. I picked up my blue ceramic mug, took a sip of my coffee and discovered that it had gone cold.